Alang-alang (Imperata cylindrical (L.) Beauv.var.mayor <Nees>), Stature: herbs, grass, edging, 30-180 cm tall. Trunk: rhizome, creeping underground stems forming an inflorescence erect, dense, sparse hair on his book. Leaves: single, base close to each other, strands; ribbon-shaped, sharp pointed tip, straight, coarse, sparse hair, size 12-80 cm. x 35-18 cm. Flowers: composition compound compound grains, somewhat tapered, 6-28 cm long, each branch has two ears, branches 2.5-5 cm long, 1-3 mm flower stalks, gluma 1; ciliated end, veins 3-6, Lemma 1 (chaff); wide ovoid, short cilia 1.5-2.5 mm. Lemma 2 (chaff); elongated, tapered 0.5-2.5 mm. Palea (Husk); 0.75 to 2 mm. Stamens: anthers 2.5-3.5 mm, yellowish white or purple. Pistil: quill-shaped anthers. Fruit: type of rice. Seeds: elliptic, 1 mm long. Habitat and Cultivation: In Java grows at altitudes up to 2700 m above sea level, in the areas of open or half-closed; marshes; in soil with good aeration; the depleted areas opened; on the banks of the river; extensive secondary forest; burned areas; as a weed in cultivation; gardens and plantations. This plant can affect the cultivation of other crops, because of the relatively high sodium needs. Parts used for medical drugs is the root. In fact, its roots can be used to lower the temperature, launched urine, stop bleeding, and as a remedy for nose bleeding, vomiting blood, gonorrhea (gonorrhea), hepatitis, kidney infections. 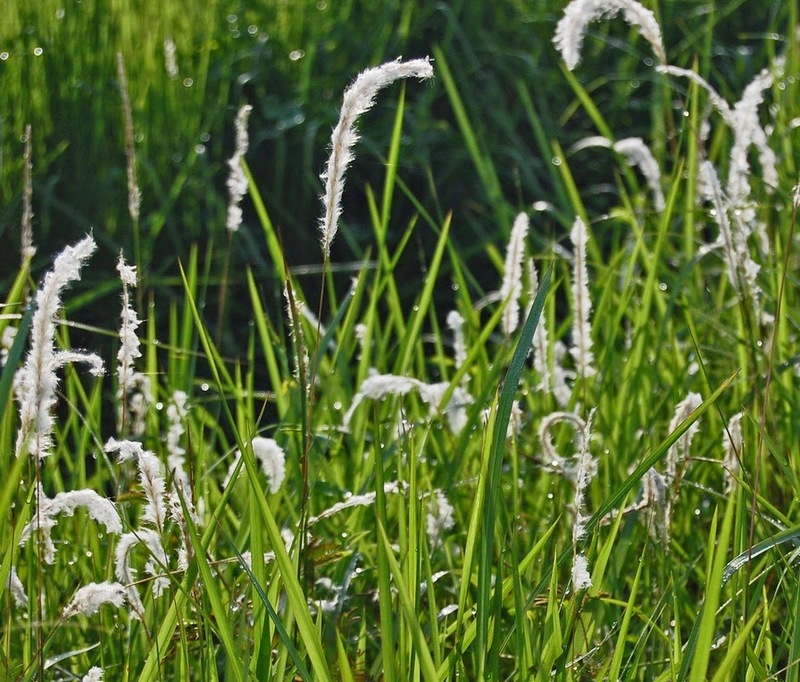 The study found that reeds containing mannitol, glucose, malic acid, citric acid, coixol, arundoin, silindrin, fernerol, simiarenol, anemonin, achine, alkali, saponins, taninin, and polyphenols. Pharmacological Effects: The taste is sweet and cool properties, anti-pyretic (decrease heat), diuretics (urine laxative), hemostatic (stop bleeding), entered the median lung, stomach and small intestine. Roots: metabolites have been found in the roots of reeds consists of arundoin, fernenol, isoarborinol, silindrin, simiarenol, kampesterol, stigmasterol, ß-sitosterol, scopoletin, skopolin, p-hidroksibenzaladehida, catechol, chlorogenic acid, isoklorogenat acid, p-kumarat, neoklorogenat acid, acetic acid, oxalic acid, malic acid-d, citric acid, potassium (0.75% of dry weight), a large amount of calcium and 5-hydroxytryptamine. From the results of other studies on root and leaf was found five kinds of derivatives are derivative of flavonoid 3 ', 4',7-trihydroxy flavones, 2 ', 3'-dihydroxy-6-hydroxy kalkon and flavanols. A flavonoid derived class might include flavones, flavonols substituted on the 3-0H, flavanones or isoflavones contained in the soluble fraction of ethyl acetate extract of the roots of weeds. In the fraction of water-soluble extract of the roots of weeds class of flavonoids found no free OH groups, flavones, flavonols substituted on the 3-0H, flavanones, or isoflavones. Plant part used: Roots, rhizomes (leaves) and flowers. can be used fresh or dried. Rhizomes or roots stay. This plant is very easy to grow and are everywhere around us. Is a wild plant and lead as weeds. It grows wild in the street, in the fields and in the woods. These herbs include chronic herb, may reach a height of 180 cm. Solid bars, rare books haired. Ribbon-shaped leaves, green, rough leaf surface. Inflorescence in the form of grain, color white, flowers located at the top is the perfect flowers and is located below the barren flowers. Flowers easily blown by the wind. Rhizome: skin softener; urine laxative, blood purifier, appetite enhancer, stop bleeding. in addition, it can be used also in the treatment efforts venereal diseases (gonorrhea, blood urine, lion king), kidney disease, wounds, fever, high blood pressure and neurological disease. All parts of the plant are used as animal feed, paper materials, and for the treatment of ringworm. BIOLOGICAL EFFECTS OF PHARMACOLOGY Infuse and reed rhizome as a diuretic effect, on the basis of an increase in the concentration of electrolytes (Na, K, Cl) white male mouse urine. Giving infusion roots of the weeds with a dose of 40, 50, 60, 70 g / kg antipyretic effect on the guinea pig. Reed flower infusion at a concentration of 10% at a dose of 12 ml / kg antipyretic effect is relatively similar to paracetamol suspension 10% in pigeons. Clinical trials: Dekokta roots of the weeds with a dose of 250-300 g, 2 times morning and evening to cure 27 cases of 30 patients with acute nephritis. In chronic nephritis, herbaceous weeds can reduce edema and lower blood pressure. Dekokta herbs 250 g in the singular or in combination with the rhizome and leaves of Nelumbo nucifera and Agrimonia pilosa leaves can treat epistaxis (nosebleed), hemoptysis (coughing up blood), hematuria (blood urine), menorrhagia, and upper gastrointestinal bleeding. In addition it was also reported that the roots of the weeds dekokta can be effective for the treatment of acute viral hepatitis in 28 cases; usually used together with Plantago asiatica, Glechoma longituba and Artemisia capillaris buds. Toxicity: On the use of the rules, practically non-toxic. Dfinginkan effects: Dizziness, nausea, an increase curiosity bowel movements, occasionally occur in clinical use. Pharmaceutical Technology: Cellulose leaf weeds absorption of water has a relatively well in the manufacture of tablets are printed directly. When suffering from a urinary tract infection, you should immediately consult a doctor. This herb can be used as an alternative medicine in addition to treatment of a doctor. Brewed, made ​​by infusion or pill. Drink 1 a day, each time drank 100 ml. For the form of pills taken 3 times a day 9 pill. 2. Nosebleeds, Blood Urine, Blood and Vomiting. When suffering from vomiting blood urine or blood, you should immediately consult a doctor. This herb can be used as an alternative medicine in addition to treatment of a doctor. Brewed, crushed, made ​​by infusion or pill. Drink 2 times a day, morning and evening, every times drinks 100 ml. (for infusion). To its water taken 2 times a day, morning and evening, every time you drink one fourth cup. For pills taken 3 times a day 9 pill.